You’ll want experienced, licensed guides for this trip. Let us do all the work – you just enjoy the hike and the sunrise view. We provide the gear, cook your meals over the volcanic steam and pack everything for you. Hike the Caldera, get a dip in the hot springs and taste Kopi Luwak on your way back. 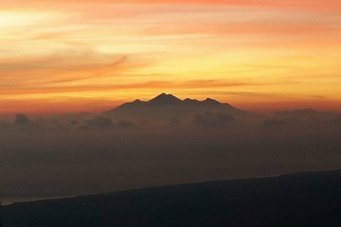 The sunrise atop Mount Batur is spectacular and may only be matched by the equally spectacular sunset. Get both with this package. You’ll enjoy a moderate hike to the summit where our guides will set up your tent and prepare your dinner as you enjoy the setting sun over the western sky. Wake up early the next morning for the sunrise over the the eastern sky and ocean as your guides prepare a hot breakfast cooked over steam from the volcano. You’ll get the full treatment and won’t have to do anything, but enjoy your trek and the views. 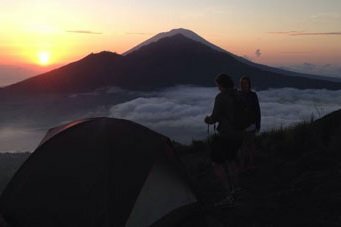 That’s the advantage of trekking with experienced, licensed guides who know the best campsites on the volcano. Both the hike up and down will be scenic as you trek across the crater rim of Batur and back down to Toya Bungkah village to soothe your body and soul in the natural hot springs. On your way back, we’ll make a stop at a coffee plantation where you can learn about Balinese coffee and taste Kopi Luwak, the rarest coffee in the world. About mid-afternoon, our friendly, English-speaking driver will pick you up from your hotel in our air conditioned van. You’ll drive to the starting point at Toya Bungkah village where you’ll meet your English-speaking guide for a briefing on the trek. We encourage you to ask any questions regarding safety and the trek as well as the history and culture of the local area. The hike up the volcano will be in daylight and you’ll get to experience the beautiful landscape and views as you ascend the mountain. Once at the top, the guides will set up camp, pitch your tent and prepare your dinner as you relax and enjoy the fantastic sunset over the volcanic valley. You’ll see the sky turn to almost every color you can imagine as daylight gives way to evening and eventually night. Here’ you’ll see millions of stars and be able to count the planets and constellations as well as the occasional shooting star. 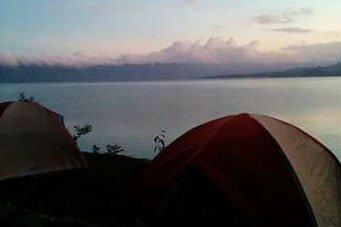 You’ll wake up bright and early and open your tent to an amazing sunrise and view over the eastern sky as your guides prepare a morning breakfast cooked over the heat of volcanic steam. Enjoy coffee, tea or water with your breakfast. After the gear is packed by your guides, you’ll head back down the volcano and across the rim of the crater with stunning views. Near the base of the mountain we’ll relax our muscles and joints in the soothing waters of the natural hot springs in Toya Bungkah village. We’ll board the van and make one more stop at the coffee plantation for coffee and tea tasting before heading back to your hotel. 03.00 PM: Arrive at Toya Bungkah village, meet guide, get briefing and begin trek. 05.00 PM: Approximate arrival to the top of the volcano and camp site. 05.30 PM-07:30 PM: Refreshment, sunset viewing and dinner. 08:00 PM: Star gazing before bedtime. 05.45 AM: Wake for Sunrise and breakfast. 06.45 AM: Prepare for our trek across the crater rim and back down the mountain. 09.00 AM: Arrival back to Toya Bungkah village and hot springs. 11.30 AM: Visit to a coffee plantation. 12:30 PM: Back to your hotel. 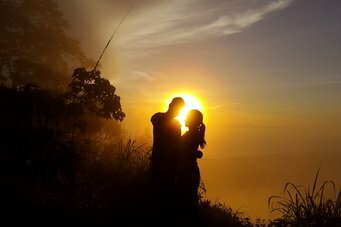 Your fee includes entry to Mount Batur Park as well as the hot springs. Please keep in mind that because all our treks and tours are very limited, we must insist on a 2 person minimum per booking. If you wish to book this package as a solo traveler, we must include a 50% charge to the total fee. Service charges are not included in the fee so although tipping is not mandatory, it is always appreciated for guides who exceed your expectations. Change of clothes for after the hot springs. How long will it take to climb to the top of the volcano? It takes 1.5 to 2 hours to trek up the mountain, depending on the fitness level of the group and the pace, which is set by you. The entire time up and down, including camping is about 18 hours. Yes. The last eruption was in 2000 and lava continues to flow. 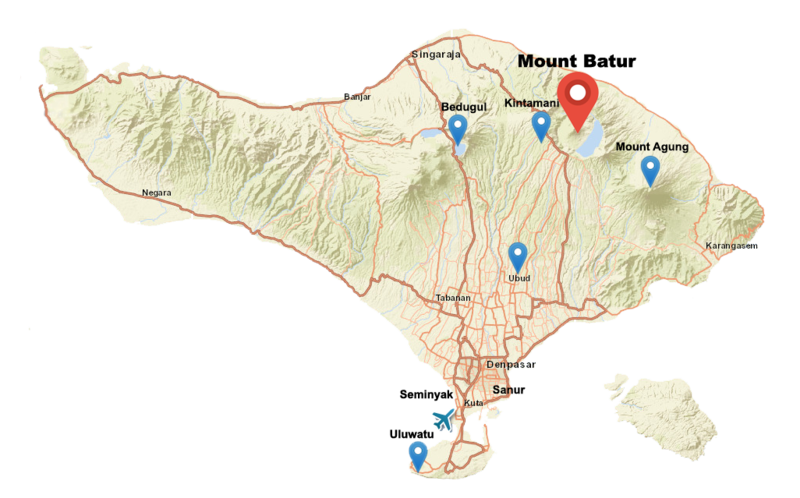 Scientists are pretty good at predicting when eruptions occur so there is very little danger of a volcanic eruption while you are trekking Batur. For more information, please contact us here. Yes. You can see lava flows from Kintamani as well as other parts of the hike. 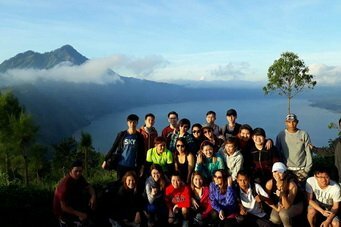 Our guides are experienced trekkers of Mount Batur and will take you to views of lava and other interesting scenery. Yes. The locals can be very protective of the mountain and usually insist that you take a guide, even though it is perfectly legal to hike up the mountain without one, provided you pay your fees. You will likely run into trouble with the local association, however, so we highly advise using a guide for this trek. 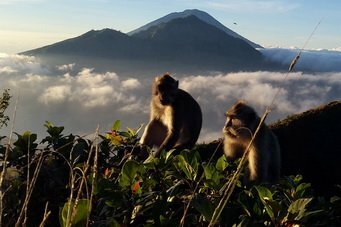 If you do not choose to use Bali Trekking Exploration, we encourage you to use another guide service that is experienced, licensed and knows the volcano. Unfortunately, because we can never predict weather conditions, it is impossible to say how well you will be able to see the sunset and sunrise. Fortunately, this trek never disappoints. Guests overwhelming have rated this package as one of their favorites, even when there has been substantial cloud cover. The scenery and views continue to remain spectacular during all weather conditions. Mount Batur has an excellent mountain rescue team and guide association. 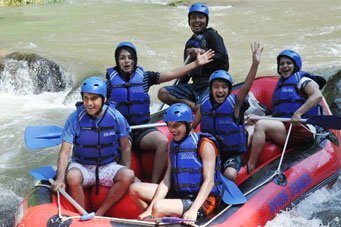 Additionally, our guides are trained in basic first aid as well as rescue procedures. If a guest is injured, the guide will immediately assess the situation and determine if evacuation is necessary. If so, the rescue team will immediate ascend to the point of the injured guest and take them down the mountain and to the nearest hospital where next of kin will be notified. It’s possible there will be other trekkers on this volcano. 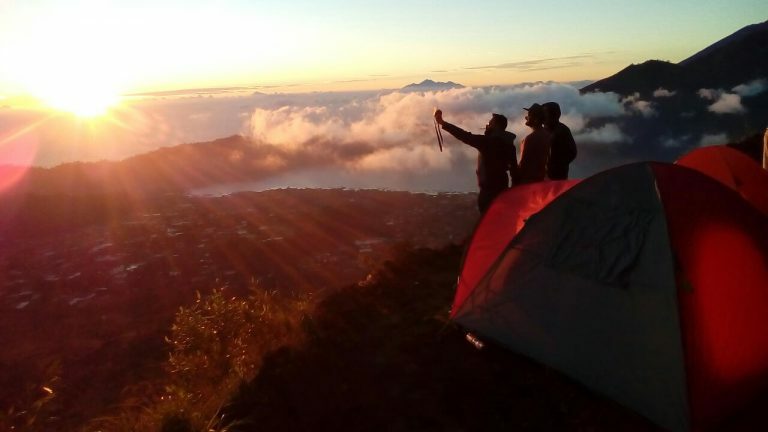 Mount Batur is popular with locals and western travelers alike; however, our guides are experienced climbers and know where to avoid the most crowds and yet still provide you with the best scenery. Batur is very safe to climb, but if you have a serious fear of high places, we recommend you consider your options before climbing. Mild fear of heights is usually not a problem and our guides have helped plenty of people in similar situations as they ascended the mountain.